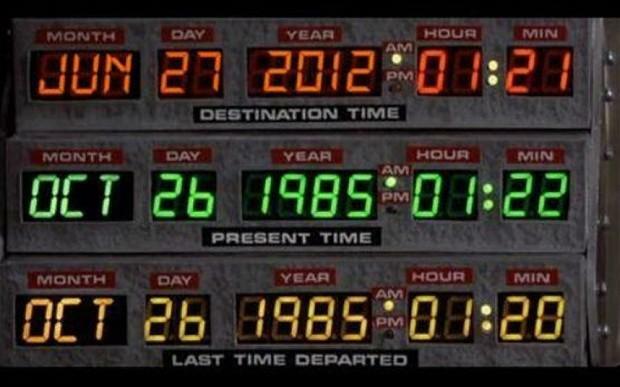 In case you missed it today marks the day in Back to the Future II in which Marty & Doc jump in the Delorean and travel to in the future - October 21, 2015. I was 8 when that movie came out, but I still remember the hover board, and how I couldn't wait until I had my own in 2015. Well, today is today, and I still don't have a hoverboard, the Cubs haven't won the World Series, and there were only 4 Jaws movies (3 too many I know). However, as far off as that movie may have been with its predictions, the one thing it did do was give people a fascination with what the future may look like. When it comes to predicting the future, it's not so much what you think will happen, but what you WANT to happen. There are a lot of things I hope may come true for the world, but that is just way too hard! Therefore, I thought I'd write a screenplay for the next installment of the Back to the Future franchise titled 'Back to the Future School'. Yes in the future technology will not be treated as a side, to the regular classroom instruction. Using an app, web tool, or hardware device will not be treated as an event. Coding will be as ingrained in the curriculum as literacy or numeracy, and our debate over 1:1 vs. non 1:1 classes will be a thing of the past. We will finally realize there is a strong connection between learning environment and learning. That if we want to truly differentiate our instruction, we also need to provide areas within the classroom that allow for this differentiation. Couches, chairs, individual seating, and group collaboration areas will all be the norm. Students will drive their own learning; popping into the class that they need to for that day & time. Want to work your way through the science curriculum today? Go for it. Want to solely focus on geography and history today, well that can be done. Don't hear a bell? Well that's because there aren't any. This may apply more to the secondary folk, but still could be applied to all grade levels. I know it's a terrible acronym but the point is we will place as much emphasis on all disciplines as we currently do with STEM. In order to be successful, students will draw on knowledge & experience from a variety of curriculum areas, and connect the dots. This also lends itself nicely to doing away with single subject classes, and offering courses that bring multiple curriculums together. Students will learn about the 'Physical World' a class that looks at Geography, Physics, Biology, and Math in one 'class'. Studying will take on a whole new meaning in the future. Students won't be cramming for a tests; they'll be studying on their own, when they need to, in order to actually demonstrate their learning by DOING. Single, one-off assessment pieces will be a thing of the past. Do I want to know what lil' Jimmy knows? Absolutely. But I want lil' Jimmy to show me through his demonstration, his ongoing learning process, and his ability to perform what he has chosen to learn about. Will all of these things actually happen? Probably not. Some will be achieved, others won't be, and some we'll blow right past and offer solutions and examples I can't even fathom right now. Back to the Future didn't nail every prediction, but it didn't have to. It simply offered ideas, and inspired people to take steps toward making them a reality.